The ruling was a whopping ten pages long as it was filled with legal analysis and definitions of what constitutes a vegetable. Even though she ruled in favor of the ban, Judge Monica Gordo acknowledged that she wasn’t quite sure how a vegetable garden can ruin the aesthetics of one’s property. However, she stated that the democratically elected government has every right to dictate what constitutes an ugly front yard, and gardens are apparently a contributing factor. “Given the high degree of deference that must be given to a democratically elected governmental body … Miami Shores’ ban on vegetable gardens outside of the backyard passes constitutional scrutiny,” Gordo wrote. The court’s decision was based on a three-year long legal battle of Tom Carroll and Hermine Ricketts. They were facing a fine of $50 a day, not for robbing banks, or trafficking humans, or running some other criminal enterprise — but for growing their own food. For 17 years, the couple grew their own food in their front yard until one day, the state came knocking. No one was harmed by the couple’s garden, it was entirely organic, and in nearly two decades, not one of their neighbors ever complained. The only injured party in this ridiculous act was the state. According to the tyrannical legislation, all homeowners are subject to the same absurd constraints. Their yards must be covered in grass — that is the law. The hubris that it takes to claim that no one has a right to grow vegetables in their front yard is mind blowing. Carroll and Ricketts’ yard is not publicly owned and is not subject to the government’s ‘uniformity’ code — especially when all they are doing is growing food. 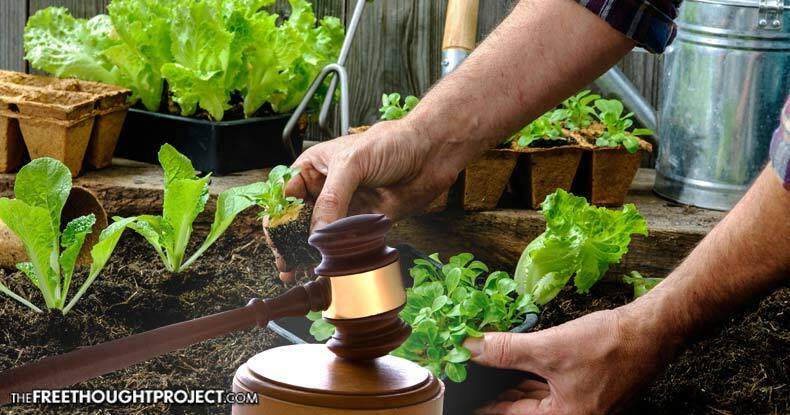 This case is different than many of the other gardening cases that arise across the country as the majority of front yard gardens are opposed by Home Owner Associations — not the government. When an HOA tells someone they cannot grow a garden it’s because that person voluntarily agreed to the rules. Unlike members of HOAs, however, Carroll and Ricketts never agreed to these arbitrary constraints on their private property, which happened to be imposed on them nearly two decades after they’d been growing their own food. While Ricketts and Carroll are upset over the ruling, the do not plan on backing down anytime soon. The upscale village in Northeast Miami-Dade has long insisted it had every right to regulate the look of the community. At a hearing in June, the village’s attorney said vegetable gardens are fine in Miami Shores, as long as they remain out of sight in the backyard. “There is no vegetable ban in Miami Shores,” Sarafan told the judge. “It’s a farce. A ruse.” However, it’s not a farce. People cannot grow food in their front yards because the government thinks they are unsightly. “They can petition the Village Council to change the ordinance. They can also support candidates for the Council who agree with their view that the ordinance should be repealed,” Gordo wrote. However, that is what this couple has been doing for years. Changing the system from within has had zero effect. The irony here is that had Carroll and Ricketts been growing their garden in the backyard, spraying gallons of glyphosate and permethrin into the air, the city would have been entirely fine with it. Only when this innocent couple dares to grow food in their front yard, violating the “aesthetics and uniformity” of their control freak government, do they ever hear a word. In modern day America, growing your own food has now become a revolutionary act.